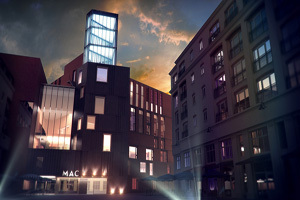 The Metropolitan Arts Centre (MAC) is set to open in early 2102, in the Cathedral Quarter of Belfast. The venue, which is six storeys high, will be Northern Ireland’s flagship home for the arts, including theatre, dance and music. It offers versatile events space, including two theatres, one with 350 seats and the other with room for 120.